Congratulations to Alexander Armstrong on being awarded the 2016 George Johnson Law Prize. The Award was presented by His Honour Deemster Doyle to Mr Armstrong who was accompanied by colleagues from Callin Wild. His Honour Deemster Doyle said “Before I make the formal award of the George Johnson Law Prize for 2016 I would like to say a few words about the history of the prize. 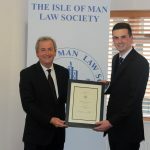 The prize was established in 1943 in memory of George Sayle Johnson, a former President of the Isle of Man Law Society, with the objective of encouraging the study of law. The prize has a long and distinguished history. It is a great honour to win it. There was a lot of first class competition for the prize this year. The prize this year goes to Alexander John Armstrong for his thought-provoking essay on “Will advocates and judges be replaced by computer-based services in the future?” which persuasively argued that human judges and advocates have a future – that’s a relief. We must all make proper use of modern technology but it would appear that human beings, giving advice as advocates and making decisions as judges, will be around for some time. The essay shows that the author has indeed studied the relevant subject in detail and that the objective of the prize has been satisfied. Click here to read the winning entry 2016 Alexander Armstrong.